At last my Refractory paper appears. It's been almost two years since I sent the initial abstract. I am worried now that it's a whole heap of crapola that I would never write now but hey....whatever. It's still nice to see my name in print. "we're not invincible we're vincible"
I've spent the last week or so rationing myself to one episode per day of Flight of the Conchords Series 1 and finally finished today. I never managed to catch it before due to Channel Ten's poor programming and my lack of TV recording equipment (a situation that we are all aware is now remedied). All the while Murray makes meticulous notes in pencil on his yellow legal pad ("No gigs"). Other delights were the ongoing satire of the mistaking of Australians and New Zealanders, the thickness of the New Zealand accents, the ignorance of Arj Barker as their friend Dave as to where the Conchords actually come from ("England or somewhere"), the notoriety of Lord of the Rings as the only other thing people might recognise NZ for, and Kristen Schaal as Mel, their one and only slightly unhinged fan. This however, was my favourite scene of all. Warning: if you are a serious LOTR fan you may find the following scene offensive. Oh..and the title of this post...a great line. We are all indeed most vincible. No-one is invincible. 2. change the ringtone and text message alert tone but only from the presets it came with. 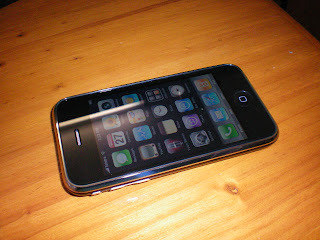 3. work out that I had to actually import my sim card contacts after almost 24 hours of wondering where to find them. 6. messily access the internet. with that one i definitely need more practice. 8. import selected playlists from itunes and listen to some songs. 10. look unsuccessfully for a cover thingy. there seemed to none about the shops this morning unless i wanted tiger print. (the helpful man at telstra basically told me their range was crap and to look elsewhere). As for whether it's better than the previous model, I can't say. But it is definitely more exciting than my samsung handset. More iphone adventures await me. But watch out Derek Zoolander because my hair turned out wonderfully well. Beautiful colour and the cut makes my fine hair look like it has actual body. Some hair magic going on. Firstly, thank you for your reminder call yesterday evening. I had my appointment written down for 1:30, so would have totally missed 10am. Phew crisis averted. Now as we both know this is the all important cut and colour before the brother's wedding next weekend. Please don't cut my fringe too short. You never have before so now is not the time to start because I hate that. And if the colour can just cover up the few grey threads without looking too startling that would be most appreciated. I'll bring my own book if that's okay, because Italian Vogue is all very glossy and beautiful but I don't speak Italian so it's a little lost on me. I will however take you up on the offer of a cup of tea. Just so as we're prepared. Looking forward to seeing you at 10. Some classic music - because it is both raining and Monday. At the risk of repeating myself I say to you "bargains"
Before returning to Bundaberg on Thursday we stopped off at Chermside for a little shopping. The express purpose of the visit was for my mother to look for a wrap for the Wedding of the Century (see sidebar). However, the amount of money I spent in a swift three hour swing around the centre was astonishing. I may have been dazzled by the bright lights, the specials and sales, and just the all round impressiveness of this mecca to consumerism. I may also have an incurable addiction to shopping. 2. A pair of white jogger, sneaker things - also marked down to 80 dollars instead of 120. Again, I say to you, bargain. 3. A black Italian mohair wrap. Not marked down but just right for Wedding despite the fact that I now have four wraps to choose from on the day in varying weights and materials. 4. A grey, sort of paisley patterned scarf. I'm buying a lot of grey lately. I slightly concerned that like the myth about dog owners I am secretly trying to look like my cat. Anyway, it's nice, even though I didn't actually NEED it. 5.Three books for the price of two (you see them listed in my sidebar under Reading. NB. The DVD recorder manual was not one of them). At the risk of repeating myself. Bargain. 6. Flight of the Conchords Series 1. Yes I am a late adopter of Flight of the Conchords. This doesn't mean I appreciate their absurd, deadpan music theatre sitcom any less than you cool people who have been engaging with them for some years. I am restricting myself to one episode per day. 7. Curb Your Enthusiasm Series 6 - no explanation necessary. I am saving this until I have finished with the Conchords. 9. A pair of swirly silver earrings - 5 dollars. What was that I hear you say? - Bargain. I wore them last night to the concert. See, useful! 10. Clinique foundation. Yes technically I know I can buy that here in Bundaberg but I was walking right by the counter in David Jones, so you know, why not? 11. Green tea with vanilla from the T2 shop. I am drinking it now. Probably not a bargain, but definitely useful. Imagine if we had stayed the whole day. Despite what my little sidebar says, tonight is the Q150 Concert for Orpheus Singers and Bundaberg Youth Choir. What does this mean I hear you ask (or maybe not). It means we have been rehearsing a selection of choral music by Queensland composers and about Queensland. There are a few Stephen Leek and Colin Brumby pieces, as well as even newer works by Sandra Milliken and Harley Mead (don't worry I'd barely heard of them either). So that's interesting. At the other end of the musical spectrum we have real old bottlers found in the depths of collections of old sheet music. One - The Sunshine State - was a favourite in schools some decades ago and starts with the delightful line "Life is great in the Sunshine State, every Queensland heart sings a song"...and don't worry the words get even kitschier from there. We've also got a great music hall type tune about aviator Bert Hinkler (who lived IN BUNDABERG) and a song someone found that is actually about Bundaberg with the immortal chorus "B-U-N-D-A-B-E-R-G...that's the place where I am longing to be". It's fabulous. And did anyone know Vance Palmer was born in Bundaberg. I certainly didn't, but a composer from Gayndah, Helen Morris has written a beautiful choral arrangement of his poem The Pathfinders. It's a pretty light night for me in my role as accompanist. Most of the Orpheus pieces are unaccompanied so while I've had to do the neverending notebashing at rehearsal I don't have to do much tonight. I do have to play a piano duet which I must run and practice now, as well as accompany one of the Colin Brumby pieces (thanks Colin for the endless threes against twos because that's always fun). Oh and I wrote the narration for the compere. That was a nice job. So now I must decide what to wear, make myself beautiful and get moving for our little bit of regional cultcha. "i said be careful his bow tie is really a camera"
You know I was little disappointed in myself yesterday because up until the moment when Simon and Garfunkel appeared on the stage, I didn't seem to be excited at all. This was strange, but then as they emerged together in a spotlight a long way from where we were sitting in the "upper circle" (which sounds posh, like the royal box at the opera or something, but really is code for "see those little pint sized dots way down there, that's who you've paid to come and see"), I got quite a little bit emotional and choked back a few tears. They started with Old Friends, quickly added the band for some rocking Hazy Shade of Winter and it kept going from there. Thank goodness for the big screens. Living in the regions (or "the sticks" as some us like to call it) I rarely get to big concerts anymore so hadn't been to one in the era of the big screen (that I recall). In fact (and here I display my age) the last time I went to the Entertainment Centre was when REM was touring their Monster album. 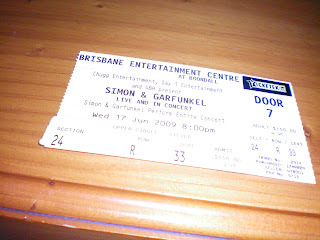 I don't remember anything about it except that Michael Stipe had a music stand with all the words (which I found surprising) and that when we caught the train home and got off at Toowong, the platform was locked up and we had to wait for some security person to let us out. Misty, water coloured memories. I digress. So sure, Simon and Garfunkel are getting on and the audience was dominated by so called "baby boomers". Garfunkel's voice isn't as strong in its beautiful top register as it used to be, but that's to be expected. He made up for it with his light expressive singing of the wonderful Paul Simon lyrics, although he occasionally let fly with a big sound, as in Bridge Over Troubled Water. I'm guessing he'll have to pace himself and avoid the swine flu to get through all the performances vocal chords intact. Paul Simon's voice has deterioriated less which meant sometimes the balance in the harmony wasn't as fabulous as it could have been. But I'm being pernickety here (and that could have been a mixing thing). And goodness me, he can still play that guitar like the finger picking folkie cool cat that he started as. For me, what the concert was about was the songs themselves which are timeless, poetic, political, humorous and finely crafted. They have stood the test of time and will continue to do so. Highlights were America, Kathy's Song, The Only Living Boy in New York, Sounds of Silence, The Boxer and a fun and funky finale of Feelin' Groovy. They also each took a turn at some of their solo work. The absolute highlight here was Paul Simon's Diamonds on the Soles of her Shoes. The band was tight, and included (joy of joys) an accordion! But I missed At the Zoo, Baby Driver, Punky's Dilemma, Keep the Customer Satisfied, Richard Cory, Dangling Conversation...and every other song they ever recorded. Yes, I know they couldn't sing them all. And Bye Bye Love...they chatted about the influence of the Everly Brothers and then sang Gene Vincent's Be Bop a Luba (not sure on the spelling here). This was one of the finest moments and made a perfect second last song. Time passes, but some music returns to us again and again with new nuance and poignancy (as I'm sure this does for them as they sing it many years after its composition). 2. Dry the above - preferably outside on the line. I am rather lazy though so often I get them out the machine and think "Stuff climate change, I'm just going to chuck these in the dryer". 3. Remember to put out the wheelie bin (not as simple as you may imagine) while also being bothered to empty all bins in the house. 4. Email back publisher with manuscript corrections. Now, this has been a task that I have set myself everyday since last Sunday and failed to complete it. I blame work plus my tendency for procrastination. Work mostly though. There are only three very minor errors that I found but when I had the time I didn't have the inclination, and when I had the inclination I didn't have the time. 5. Water the garden. Usually I rely on it raining but with this cold, dry, sunshiny weather the rain has failed me. Rest assured though if I do water the garden it will most likely rain tomorrow. 6. Nanna nap. This item is non-negotiable, must do, and if anyone disturbs me there will be crankiness and pain (for them, not me). 7. Begin my journey towards non-scraggy fingernails. This will involve an emery board, moisturiser and Dr Lewinn's secret nail formula. I have now three weeks to have acceptable fingernails for my brother's wedding. No, I know it's not long, but I believe it's do-able. 8. Practise piano duet part for choir concert next Saturday night. It's not difficult but I probably need to look at it at least once before rehearsal tomorrow. Wish me luck, because it is Sunday after all, and I'm just as likely to hang about in my pyjamas watching television. These two performances made my Friday evening of television memorable. Firstly, Elvis on his own. And then, Renee Fleming singing this fabulous aria from Tosca. This is one of the very few pieces of music which has ever moved me to actual tears. (The other was a live performance of Britten's Ceremony of Carols after which I somewhat embarrassingly cried for about five minutes. Still not sure why). Anyway, you may be relieved to know ( or not) that I didn't sit home alone sobbing at this performance, but once teared up when I was accompanying a wonderful soprano from Bundaberg who is now studying at the con in Brisbane. When she becomes famous (which she will) I'll be able to say I knew her when. In the meantime, you'll have to make do with Renee. I know there are many people who are huge fans of The Goons. I would not count myself as one of them (being as that they were a little before my time). However, as a small child on long car journeys in our family's yellow Datsun 200B we would listen to an eclectic version of cassettes that included Neil Diamond's Hot August Night, The Best of John Denver, the soundtrack to the Muppet Movie, the soundtrack to Godspell, Barbra Streisand's Greatest Hits, and it seems a tape of Goon Shows. There is one line that I have remembered after all these years and it has become something of a family catchphrase in the cold weather: " Put this porridge on,come in.Come in and warm yourself by this roaring candle". Very appropriate for the chilly night ahead I think. I might just put the candle on now. This is one of the first songs I can ever remember hearing. My parents owned a double album of Donovan and it seeped into my consciousness as a child. Later as a teenager I rediscovered it and adored it for it's simplicity, catchy singalong chorus, and fabulous last line. I hadn't thought about for years until it popped into my head this afternoon. It's just as cute and delightful as I remember all these years later. In fact it's quite difficult to listen to it without smiling. Suddenly the minor worries and concerns of the day fade away into the cloud of banality from whence they emerged. I'm wondering if I kept my 501s with the ripped knees that were my pride and joy (because they were ripped through wear and tear over a number of years, not pre-ripped). I'm also regretting that I never bought a pair of doc martens but thinking I might have found an explanation for my apparent T-shirt addiction. I'm lamenting the loss of my red converse sneakers that served me so well round and about st lucia some years ago now but pleased I've never thrown away my long paisley crinkle skirt even though I haven't worn it for years. I try not to go on about my job here because mostly it's really wonderful, but after a "training" session this afternoon I must vent. - tracking the "lifecycle" of a student through a new and complicated Customer Relations Management system. Contrary to popular opinion students are not tadpoles. - having jobs allocated to me in my very own special "queue" which I am expected to check every day and to which my supervisor has access. Do I hear anyone screaming "FOUCAULT?". Oh... wait...that's me. - finding the mythical time in which i am able to research instead of doubling up on pointless busy work. (If I ever find myself in a pop band I have decided that phrase is going to be its name). - working in an institution that values the education of its students over and above the capacity we have to "sell" them things. Normal blogging activity will be resumed as soon as possible. What's wonderful about long weekends is that it's like you get two Sundays. So after the obligatory Sunday, cleaning, tidying, washing, trip to Bunnings and some proofreading, I treated myself to a sleep on the lounge, safe and happy in the knowledge that I would get a second chance at such luxury again tomorrow. Someone else in the house also treated themselves to a nap (and they're still there I might add). 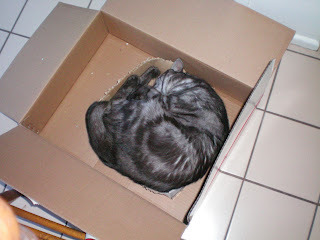 In my tidying up I decided to put the first cardboard box (now severely chewed) inside the newer cardboard box. At the risk of having to change the name of this blog to "The Cat Lady", I provide you with photographic evidence of my cat's love of squeezing itself into places that are clearly too small for its ever expanding girth. Some Russian doll style, we have a cat inside a box inside another box. As it should be. This being a blog that describes itself as all about televsion I should probably say something about the whole Chaser controversy, so here it is: I don't care. I don't watch "The War" because I don't find it funny and never have. CNNNN was a far superior effort by this group of so-called comedians. I will admit I didn't see the offending sketch but it sounds like it was more of the black-hole (rather than simply black) humour that characterised the previous series (which is the one during which I gave up on them). Phew that's over and done with. What I did do last night was have a thoroughly enjoyable evening in front of the televsion by watching Bill Oddie's family history on Who Do You Think You Are? on SBS. This was a thoughtful journey into Oddie's family tree, centring on unravelling the true story behind his mother's incarceration in a psychiatric asylum for most of Oddie's childhood. What's best about these programs is when the personal story intertwines with the social and cultural fabric. Here we had a story of both the effects of the Industrial Revolution told through Oddie's ancestors' work in Britain's cotton industry, as well as the developments in medicine and mental health. It was fascinating, sad, funny and poignant. For some reason I woke up this morning thinking about this absolutely fabulous theme song. So of course I had to share it with all of you. I watched this program a lot growing up as a child and the only thing I remember about it is the song, and the name Frank Lupo (in the credits) because we would also make hilarious jokes in our living room about how it should be "Frank Loopy". That's right, there's a deep, untapped vein of comic genius in the Davis family. And then, as an added bonus I remembered this - which is even better. Suddenly, Friday morning became a whole lot more interesting. "as much lift as you can get"
This afternoon saw me trip out to the dressmaker with my little black dress. What I thought would be a simple alteration job of shortening the straps has turned into a major dress operation, requiring a refitting on Saturday once I have purchased a strapless bra with (and I quote directly) "as much lift as you can get and perhaps also some chicken fillets". Aaaagghhh. Because (and I quote again) "undergarments are very important". And not only does she have to shorten the straps but also cut out under the arms so I am not strangled by the armholes. This involves operating on the bones in the bodice. I was not even aware there were bones in the bodice such is my ignorance of all things dressmaking. Does she use a carving knife for such a procedure? All in all, very complicated and mystifying. I'm sure you all await the next instalment of Wendy's trip to the dressmaker with interest.